Most Valley homeowners have quite a bit of money invested in their landscaping. And nothing ruins the look of nice landscaping like unsightly weeds, not to mention that no one likes the endless chore of pulling them either. The easiest and most effective way to control the weeds is to keep them from coming up in the first place. Applying a quality PRE-emergent herbicide every 6 months ‘alters’ the weed germination process and keeps them from coming up through the groundcover. Heading off the Winter and Summer weed seasons with our exclusive ‘HOTSHOTS’ pre-emergent applications will keep you virtually weed free all year round. “We mix it rich and put it in deep…” What exactly does that mean? Simply put, we mix our pre-emergent herbicide at the highest rate possible according to the manufacturer’s label and soak it into the soil with a large amount of water. Our 500 gallon tanks and heavy duty commercial sprayers ensure that the liquid herbicide solution gets through your landscape rock and deep into the soil – down to seed level. 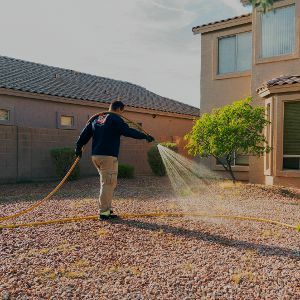 Other companies usually apply a thin “top-coat” to the landscape rock and require the home owner to water the herbicide in or hope for rain in order to be effective – not with our exclusive ‘HOTSHOTS’ pre-emergent applications. Our professional weed technicians arrive and do a thorough property (weed) inspection, apply a heavy amount of herbicide to all hardscaped areas and then treat any existing weeds (post-control) with a fast acting weed killer. Once done, driveways and walkways are swept to replace any relocated landscape rock, all gates are closed. All products used are applied per the manufacturer’s label instructions at EPA approved levels to ensure best results as well as human and pet safety. move any items from hardscaped areas; toys, pool supplies, mowers, pet dishes, etc. HOTSHOTS’ pre-emergent application is warranted. No pre-emergent is 100% effective but you should expect 80-90% fewer weeds from showing up. The results only improve the longer you keep with an every 6-months application schedule. If however more than ‘just a few’ weeds come up, contact us and we’ll stop back by to treat with our HD weed killer. Once you submit your address we will provide a quote within 24 hours. 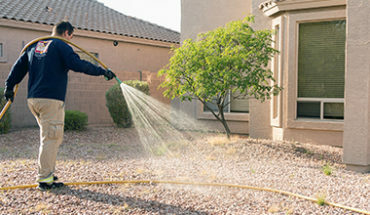 Other companies usually apply a thin “top-coat” to the landscape rock and require the home owner to water the herbicide in or hope for rain in order to be effective - not with our exclusive HOTSHOTS applications!